» Pickleball Gifts – Your 2018 Holiday Gift Guide! The 2017 holiday season is upon us which means it's the perfect time to find the perfect pickleball gift for the pickleball fanatic in your life! Aside from the standard options of pickleball related gear like paddles and bags, there are a ton of other miscellaneous pickleball related gift ideas to consider this holiday season. And if you're an online shopper like me, seeing all the options can be overwhelming to say the least! 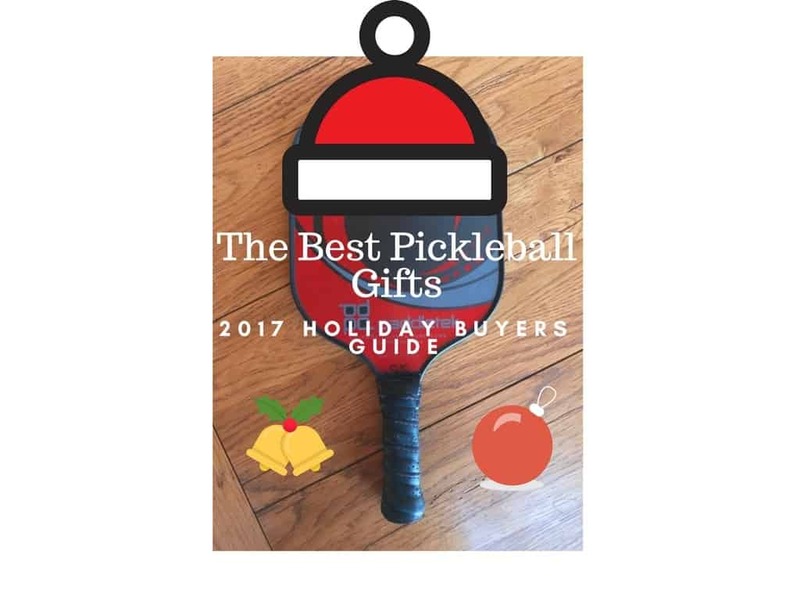 That is why we made this Pickleball Gifts Buyers Guide for the 2018 holiday season! We cover everything from paddles, bags, shoes, t-shirts all the way to wacky yet fun items like key chains and coffee mugs! For each category we've laid out below, we give you our top choices for that particular gift idea. Don't stress, shopping should be fun! If you've got a pickleball fan in your life that you're shopping for, we've got a pickleball related gift idea for you! Scroll down for more information on each category. Our Top Pick for All-Around Best Paddle. Our Runner Up for All-Around Best Paddle. Our Top Pick for Best Starter Paddle. Our Runner Up for Best Starter Paddle. Our Top Pick for Best Indoor Ball. Our Top Pick for Best Outdoor Ball. Our Top Pick for Best Portable Net System. Our Top Pick for Best Net/Equipment Set. When it comes to great gift ideas, nothing hits home like a great paddle! If the pickleball fan you're shopping for is looking to upgrade their paddle, we recommend the two paddles listed above from Pro-Lite! The Titan Pro and the SuperNova represent the very latest in pickleball paddle technology and materials and can help elevate any player to the next level. Experienced or Pro players will love these paddles! You can find additional paddle options in our Best New Pickleball Paddles for 2017 article. For the more novice player in your life, we've included the Venom Pickleball Paddle and the Rally Graphite 2.0. These two paddles were featured in our Best Pickleball Paddles for Beginners article and are without a doubt, two of the best starter paddles on the market today. In fact, the Venom is the ONLY paddle to show up on our Beginner Paddles List and our Best New Paddles of 2017 list! Pickleball balls make a great stocking stuffer! We've narrowed down all the different options available - The Jugs Balls are by far the best indoor ball and the DuraFast Outdoor rate the highest for outdoor play. Depending on where you play (indoor or outdoor) these balls tend to perform the best. And finally, for those looking to bring the fun of pickleball home, we've included the best portable pickleball net and best pickleball equipment set! The best portable net available today is the one featured from PickleNet. It features a power-coated steel frame and takes just minutes to set up. In fact, we had it set up in under five minutes and we didn't even use the instruction manual! It's that easy! The frame is solid, doesn't move and is extremely durable. However, if you're looking for a complete net and equipment set, you can't go wrong with the Tyro 2.0 Net Equipment Set. This Complete Net and Paddle Set comes with a frame and net, four paddles and four pickleball balls! This is by far the best equipment set available because of the quality of materials and products included! Most equipment sets come with cheap wooden paddles and second rate balls. Tyro however, hasn't skimped one bit, they've included four great composite paddles (great for spin) and four top-of-the-line Jugs Balls for a pickleball gift set that is second to none! Our Top Pick for Best Fun Pickleball Shirt. Our Runner Up for Best Fun Pickleball Shirt. Our Top Pick for Best Men's Pickleball Shoe. Our Top Pick for Best Women's Pickleball Shoe. Our Top Pick for Men's Tournament Gear. Our Top Pick for Best Women's Tournament Gear. Our Top Pick for Best Pickleball Hat. Our Top Pick for Pickleball Visor. If you're looking to buy something in the pickleball apparel department, we've got you covered. Pickleball related gifts can be fun and light hearted, like the game itself! And nothing captures that spirit like a funny pickleball t-shirt! We've included our two favorites - "I am a Heavy Dinker" and "Just Dink It." The heavy dinker shirt is a clever play on words and the Just Dink It option grabs it's inspiration from Nike's old slogan "just do it." For more fun, clever, and witty pickleball shirts, click here. If you're looking for a more practical apparel idea, we suggest a good pair of pickleball shoes or court shoes to be exact. We laid out all the reasons how pickleball shoes can help prevent injuries in our Common Pickleball Injuries article and the GEL Resolution 6 represent the very best options for both men and women. For more great pickleball shoes, check out our Best Pickleball Shoes for 2017 article. For the more serious pickleball player in your life, we've included a couple great apparel options for those that play in dedicated pickleball tournaments. The Nike Court Men's polo is technically a tennis shirt but works perfectly for USAPA regulated pickleball tournaments as well! For women, the Augusta Sports Dress is a great formal sportswear option for the pickleball lady who takes her game seriously! Rounding out this section are the "I Love Pickleball" hat and the "Pickleball Power" visor. If you play outside a lot, you'll want to protect your head and face from UV rays. These are two great choices for staying out of the sun and showing off your pickleball fandom along the way! Our Top Pick for Best Pickleball Sling bag. Our Top Pick for Best Pickleball Duffle bag. Our Top Pick for Best Pickleball Backpack. Our Top Pick for Best Tote bag. Our Top Pick for Best Paddle Cover. Our Runner Up for Best Paddle Cover. Our Top Pick for Best Safety Glasses. Our Top Pick for Court Accessory. For the pickleball player in your life that has the right paddle, the right shoes and all the proper equipment, accessories like a bag or paddle cover can make it all come together! The best selling pickleball accessories tend to be pickleball bags like the Pickleball-X Sling Bag or the Game on Duffle Bag. Tennis bags (backpacks) can also make great bags for any pickleball player. The more you play, the more likely you are to bring more items to the courts - like a change of clothes or separate shoes with you. So, why not show your love for the game by carrying it all in a dedicated pickleball bag? For more options when it comes to the best pickleball bags, click here. If you or your loved one treats their pickleball paddle like a treasure or if they recently upgraded to a top-of-the-line paddle, we've included two of the best paddle covers. These are bags/covers that are designed to hold just your paddle and keep it safe from dings and cracks. The last thing any pickleball player needs is for their nice, new $100 paddle to get a ding on the edge guard or paddle face. Something as small as a ding can throw off the entire feel of the paddle - all because it was not stored properly. You can read all about our top picks for paddle covers here. Rounding out our list of top accessories that make great gifts are a good pair of safety sports glasses and court lines in case you're putting together a court in your drive way. Eye wear is extremely important in pickleball, especially if you're playing with more experienced players who can put some zip on the ball when at the net. We know first hand what it feels like to get a ball blasted at our face. Injuries happen. The right eye gear can make a big difference. Our Top Pick for Best Pickleball Book. Our Runner Up for Best Pickleball Book. Great Pickleball Book by Pro Gale Leach. Our Top Pick for Best Pickleball Coffee Mug. Our Runner Up for Best Pickleball Coffee Mug. Our Top Pick for Best Pickleball Travel Mug. Our Top Pick for Best Pickleball Water Bottle. Our Top Pick for Best Pickleball Keychain. Finally, we've put together a fun list of miscellaneous items that are sure to bring a smile to the face of any pickleball fanatic. The volume of pickleball related gifts available is ridiculous! Books, cups, coffee mugs, water bottles, key chains - if you can think of it, they make it. But sifting through all the knick knacks is hard, and knowing if you've bought a quality product is even harder! That's why when looking for a great gift for someone who loves the game of pickleball, you can never go wrong with a book! There are plenty of books out there but our top three in the chart above are written by pickleball professionals and can be read by anyone - novice to expert. No matter what you're experience is, you're bound to find a piece of wisdom or two from these books. In fact, two of the authors listed above (Prem Carnot and Joe Baker) make great videos as well - check our their YouTube channels for more tips and strategies. For more from Prem Carnot click here. For more from Joe Baker click here. Now, if you're just looking for a fun stocking stuffer, like a coffee mug or stainless steel tumbler, we've got a few options for you. There are literally hundreds of pickleball related mugs and bottles available but these are our favorites because they are well made, and simple. Last but not least on our list of best gift ideas is a dedicated keychain that let's the world know what sport you play and how much you love it. For anyone who loves trinkets, this small but cute keychain makes a great gift idea. We hope you enjoyed our Pickleball Gift Holiday Buyers Guide! Again, the products listed here are our personal favorites, so they may not fit your style. At the very least, we hope we gave you some good pickleball related gift ideas for the pickleball fan in your life. Happy Holidays everyone! !